Making sure that seniors and the elderly take their medication properly is an exhausting task. So many pills look alike. It is difficult to remember which pill is which. It is perhaps even harder to remember which pills to take at what time. For the senior who may also be dealing with dementia, Alzheimer’s, or just getting a little forgetful, managing medications becomes impossible. And even dangerous. Taking their medication correctly is important to the overall safety of the elderly. While there are many medication management tools on the market, below are some of the best automatic pill dispensers for the elderly and seniors to help you out. If you are in a hurry, here is a quick snapshot of my recommended automated pill management systems for seniors. Keep on reading to learn more about how they work and important features to look for. Best for seniors who have some level of independence. Requires a moderate level of hand dexterity. This pill dispenser is a tabletop model with a tipper. Seniors are less likely to drop medicine and it’s a bit more user friendly. Because of the different programming options and alarms available, this is the best choice for seniors who takes meds less than 4 times a day. On the higher end of the price scale but lots of unique features. I love that the alarm will not turn off until the pills are removed. These devices can bring peace of mind to caregivers and family members. Here is how they work. A caregiver loads the correct pills and dosages into the dispenser. The dispenser is then set to dispense the meds at a certain time. At the right time, the machine moves the meds to a door or chute that gives the senior access to the pills. To reduce the risk of over-medicating, a key is required to open the dispenser. Chances of a drug error are greatly reduced with a device like this. Most models will also sound an alarm signaling the senior that is time for their pills. These kinds of devices are particularly useful for those suffering from Alzheimer’s or dementia for a variety of reasons. With the intense memory loss these patients go through, it’s important that they have a loud alarm to remind them to take their medications, which could be life-sustaining. It’s also important that they have a pre-determined dose ready to go, as they will probably forget how much or how many of a particular medication to take. If they take too much, his could lead to extremely hazardous side effects, or even an overdose. If they don’t take any of their medications at all, this could also be life-threatening. Alzheimer’s is a very scary disease, so make this part of their lives a little easier with a high-quality pill dispenser. There are many factors to consider when looking at your options in this category. As you read through these, decide which are the most important to you or your loved one’s needs. This will help you decide if this type of medication management system is the right option. There are 2 parts that make up a device’s capacity: the total slots available and the total pills per slot. These devices work by using rotating trays of slots. Each slot holds a dosage time’s worth of pills. The larger that each slot is, the more pills that the slot will hold. The total slots (compartments) is important because it sets how often the machine will need refilling. Think of it this way. If a tray has 28 total slots and the senior takes pills 3 times per day, you will refill the machine every 9 days. To figure this out, divide the total number of slots by the number of dosages a day. It is important to make sure someone is available within the refill time period to refill the machine when needed. The best type of pill dispenser for the elderly is one that doesn’t have to be messed with very often. The size of the slots is an important feature also. If the senior only takes a few small pills at a time, any of these dispensers would be okay. BUT, if they take large capsules or many pills at once, choose a unit with larger compartment sizes. It is important that the proper size is used because if pills are forced in the slots, they could use the machine to jam. Programming capabilities of each dispenser vary. It is important to find a machine that is capable of dispensing medication the number of times per day the patient requires. Most of the ones I review below release meds up to 6 times a day. Some can only dispense 4 times per day. Because these machines are electronic, you should have basic tech skills or know someone who does. If you can set the time on your microwave or the alarm on a cell phone, you will be fine. Once the dispensing times are set, the machine saves this information using battery backups. A few of these allow programming of a medication reminder in the form of an alarm. You can usually program what type of alarm sounds you want and length of time that the alarm goes off. This is important if the senior is hard of hearing and needs a little help hearing the alarm. A loud alarm is necessary to remind many seniors that it is time for pills. Some units offer a choice of alarm sounds and styles while others offer just basic alarms. Others even add flashing lights to alert the senior. Unless the senior has significant hearing loss, the basic alarms of these dispensers are loud enough. Another important consideration is to know how the alarm turns off once the senior has taken the pills. Find one where the alarms shut off automatically. Also, make sure your loved one is physically able to shut the alarm off as needed. When considering the use of an automated pill dispenser, have a plan in place about how to handle missed dosages. While missed doses are less frequent than manually taking meds, it is possible if the patient doesn’t hear the alarm or is a heavy sleeper. Most of these systems use rotating trays to line up medication dosages with a door. Only one dosage is available at a time. So, if the senior misses taking the dose during the time window, the missed dose will rotate back into the machine. It is impossible to get to it without a key to unlock the unit. This is a nearly universal fact of automated pill dispensers. But, these locking timed features will help keep them on track. The machine you choose should offer some level of security. Some seniors are easily agitated or just curious and may want to open the machine. This would give them access to all the pills at one time, but this could lead to an overdose. Look for a locking, timed dispenser that is solidly built and offers a security feature on the lid to get to the medication slots. 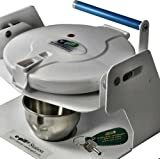 This LiveFine Automatic Pill Dispenser works by using a motorized rotating carousel to dispense medications at programmed times. The tray inside turns at the proper time releasing the next dose at the door. The user just picks up the device and shakes the pills into their hand. This unit also has an alarm and reminder tools. This dispenser has up to a 28 day capacity, but that is only if the senior takes one batch of medications a day. That isn’t the reality for most though. The device has 28 slots that will each hold up to 18 aspirin-sized pills. It comes with template rings that go into the center of the carousel that tell the patient which dose they are using. For example, if the user takes medications twice a day, you would use the template that says “Sun Morn, Sun Eve, Mon Morn, Mon Eve, etc”. This affects your capacity of course. Now you have a 14 day capacity because you took 28 slots and divided them into 2 per day (28 divided by 2 =14). So, if pills are taken 3 times a day, a capacity is 9 days; 4 times a day is 7; 5 times a day is 5 days, and so on. The templates and programming of this one max out at 6 times per day. The LiveVive Automated Pill Dispenser also alerts the senior that it is time to take their pills through buzzers, sounds and flashing lights. These alerts sound and flash for up to 30 minutes. You can choose from 4 different sounds for seniors who may have hearing difficulties. The alarm turns off by tipping the dispenser to get the medication. 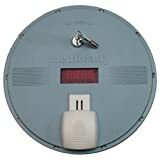 If the patient ignores the alarms and does not take the pills by the time the next dose is due, the slots will rotate so that they have no access to the missed dose. This is helpful to prevent double dosing later. It is also useful to see if the senior is missing doses because you will see the slots still filled when refilling and the template ring will tell you when that happened. This device does lock with a key to limit access to the pills. It can be pried open, though, if the elderly person is strong enough. Keep that in mind if the user gets agitated easily or is curious. Extra keys are available for this dispenser for multiple caregivers or for backup. There have been some complaints online about the keys failing to open the device. Most of these complaints happened when the machine was flipped over to unlock. It seems like the best way to unlock is hold it up over your head and unlock from underneath. This dispenser also requires 4 AA batteries (included with your purchase) and comes in at 7.9 x 7.9 x 3.9 inches, weighing 12 oz. Because this dispenser requires a little more work than others, I recommend it for seniors with some level of independence. At least, they must hear the alarms and understand how to get the pills out. This will need some hand dexterity to keep them from spilling. If the person spends much time alone, consider their mobility needs. Keep the dispenser close if the patient has mobility problems. If the user is likely to tamper with the dispenser, remember that this one could pry open. Reviewer Note: the locking unit that holds the pills is the EXACT SAME unit as the LiveFine automatic pill dispenser I reviewed before. It is just being sold under a different name. e-pill makes these units under several different private labeled brands. The features and use of the unit works the same as my review on the LiveFine unit. So, I am not going to repeat a lot of that information here. This product does add to ease of use of the automatic pill dispenser above by mounting it to a standing tipper. When the alarm goes off, the senior can easily tip the dispenser by pulling a soft rubber handle. “Sticky feet” keep the dispenser from moving while using it. Permanent mounting with screws is another option. After tipping the dispenser, the pills then fall into a stainless steel cup that the elderly person uses to take the pills. The dispenser then returns to its standby position until it’s time for the next dose. I like the idea of the patient dumping their medication into a metal cup instead of into their hand because it keeps pills from spilling or dropping on the ground. This is important because it reduces the chance of a fall caused by a senior looking for lost pills. The tipper will also silence the alarm because the tipping motion is what turns the alarm off. A few cautions about using this system. The user must remember to return the stainless steel cup after taking their medication. If they do not, and then use the tipper at the next dose, the pills could fall into the floor or other places. This could cause a fall situation if the patient tries to find the missing pills. Make sure teaching the user to always return the cup is part of the patient education. I do really like the idea of adding the tipper unit to the e-pill/ GMS/LiveFine automatic pill dispenser with the lock, though. It addresses my concerns about seniors dropping or losing medicine by having to shake. While this system isn’t as portable, it is one of the best medication dispensers for elderly people. PILL DISPENSER AUTOMATED - Program as many as 6 alarm times daily. Popular Automatic Pill Dispenser for Home or institutional use. COMPLETE MEDICATION MANAGEMENT SYSTEM - Locked Pill Box, Tipper, Medication Tray, 2 Metal Keys and Stainless Steel Medicine Dispensing Cup included. HIGH PILL CAPACITY - 28 compartment tray, Each pillbox compartment holds up to 18 aspirin size tablets. This automatic medication dispenser with flashing light by MedReady works on a similar idea as others I have reviewed. It uses a rotating tray that moves the next dose of medication to a door at the dosage time. The big advantage to this unit is that it is more difficult to force open than the others. Like many of the other products I have reviewed, this one has 28 compartments. The compartments are a bit smaller ( 1 x 1/2 x 3/4 in) than some of the others though. They hold 9 medium-sized pills per compartment. Like the others, if the elderly person takes 2 doses, you’ll need to refill it every 14 days; 3 doses per day means refilling every 9 days; 4 doses per day means refilling every 7 days. This dispenser has a maximum of 4 doses per day. It features both audible and flashing light alarms. The amount of time the alarms go off is programmable up to 240 minutes. This is a longer alarm time than other dispensers making it likely that the senior will take their pills within the dosage time frame. The device is also programmable to use both alarms, only one type, or none at all. The alarm stops once the door opens. This medication dispenser is programmable for up to 4 doses per day at custom times. However, if the user misses a dose, they can not get it back. When the tray rotates at the next dosage time, the missed pills will go back into device. This lets you know what doses were missed and when. However, have a plan in place on how to make up those doses if required by physician instructions. It is difficult to tamper with this locking medication dispenser, but it is possible. The door has a lock and comes with two keys. This is an important safety feature if the elderly person gets curious or agitated and tempted to try to open the machine. The manufacturer represents it as tamper-proof. That has not what my research has shown however. I have read a few complaints about patients forcing the tray to rotate. It is powered by AC Adapter with backup battery. It weighs about 2 pounds, and its dimensions are 14.5 x 12 x 3.5 in. Overall, there is a lot to like about this automatic pill dispenser. I like it because of the different alarm types and the unique programming options. It is the best medication management system for elderly people who take pills less than 4 times a day. The e-pill Automatic Locked Pill Dispenser is a high-end and full-featured solution for managing daily meds. It features a heavy-duty, tamper-resistant construction and larger pill capacity. The alarm offers improvements over other comparable units too. This dispenser has 28 slots to hold a dosage of medication. Each slot holds up to 20 aspirin-sized pills. This capacity is one of the largest I have seen. It also includes template rings that do on the tray to help track doses. For example, if the user takes meds twice a day, choose the template that says “Sun Morn, Sun Eve, Mon Morn, Mon Eve, etc”. To calculate how often to refill the tray divide 28 by the number of doses per day. So, if dosages are 3 times a day, refill time is 9 days; 4 times a day is 7; 5 times a day is 5 days, and so on. The templates and programming max out at 6 times per day. This automatic locking pill dispenser uses a loud alarm and flashing lights to tell them it is time to take their medicine. As long as the unit stays plugged in, the alarm will not shut off until the pills are removed from the dispenser. On battery power, the alarm sounds for 90 minutes. Once the senior has dumped the pills in their hand by tipping the device, the alarm shuts off until next dosing time. Because the dispenser uses a rotating tray, missed doses cannot be taken later. Once the next dosage time has come, the missed dosage will rotate into the machine. This helps the caregiver monitor missed doses. The senior should have fewer missed doses with this model because of the continuous sounding alarm. This device uses a robust lock that comes with 2 keys. This lock is strong and durable and would be difficult to force it open. Of course, with determination, a person may figure out a way around the lock but it is pretty solid overall. It also has a unique power system where the included dock stays connected to AC power. The dispenser should stay on the dock any time it is not dispensing pills. It uses batteries as a backup system for times the dispenser is not on the dock or for power outages. This is the best automatic pill dispenser for elderly people who can afford a high-end medication management tool. It weighs 1.8 pounds and its dimensions are 8.5 x 8.5 x 2.5 inches. There are a lot of unique features to love about this one. It is the most tamper-resistant of the units I have reviewed. I also love that the alarm will not stop sounding until the user has taken their medication. LONG and LOUD ALARM - Loud Sound and Blinking Light. Never stops ringing until pill dispenser is picked up. Images, Ratings, & Prices from Amazon Product Advertising API - Updated on 2019-04-20 at 01:07 - contains affiliate links (see footer). 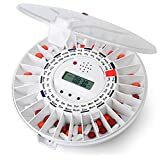 If you don’t think your senior really needs all the bells and whistles of an electronic automated pill dispenser, why not stick with a traditional pill organizer box? This ones comes with a bunch of accessories and features that make it perfect for the elderly to use to manage their medication. Its extra large compartments fit 9 fish oil pills each – this is one of the largest capacities out there. They’re also organized by time of the day, and they’re very easy to fill. With braille symbols, they can also accommodate seniors with sight problems. In terms of the case, it has velcro enclosures, which makes it easy for seniors to open even if they have arthritis or other issues in their hands. It’s also discreet and secure for travel, and comes with a sticker sheet in case the ink on the compartments wears off over time. Best of all, this bill box comes with a black card inside to include your emergency contact information as well. Automatic pill dispensers are great tools for caretakers and seniors. They help manage seniors’ medications by providing organization, reminders, and preventing harmful overdoses. You’ll want to look for a large capacity, easy to fill features, various programming capabilities, some sort of security feature, and a medication reminder. All of that is really only for extreme cases though, like Alzheimer’s patients or the very elderly. 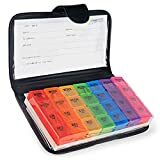 If you’re just looking for a simple pill organizer to keep your senior on track, check out the last product above. Regardless, some sort of medication management system can be incredibly beneficial for seniors and their caretakers to add organization and peace of mind to their daily routine. Which do you think is the best automatic pill dispenser for elderly and seniors? Do you have any experience with managing meds you would like to share? Let me know in the comments below! Hey Lee – thanks for bringing the Med-Q to my attention. What about it do you like best?